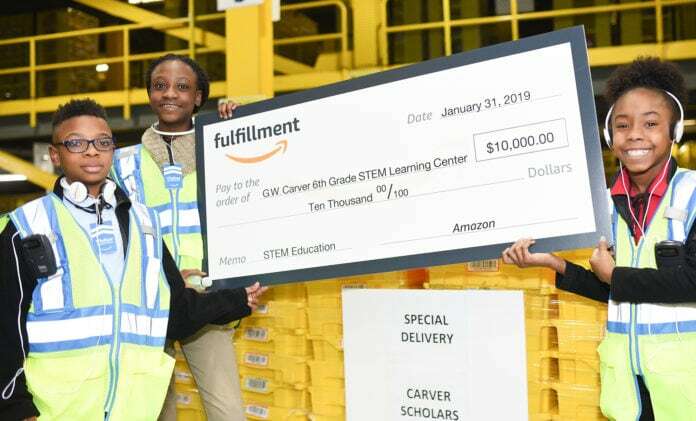 LANCASTER—Amazon presented students and staff from Lancaster ISD George Washington Carver 6th Grade STEM Learning Center with a $10,000 check after they were the first group of students to ever tour the Fort Worth Robotics Fulfillment Center. 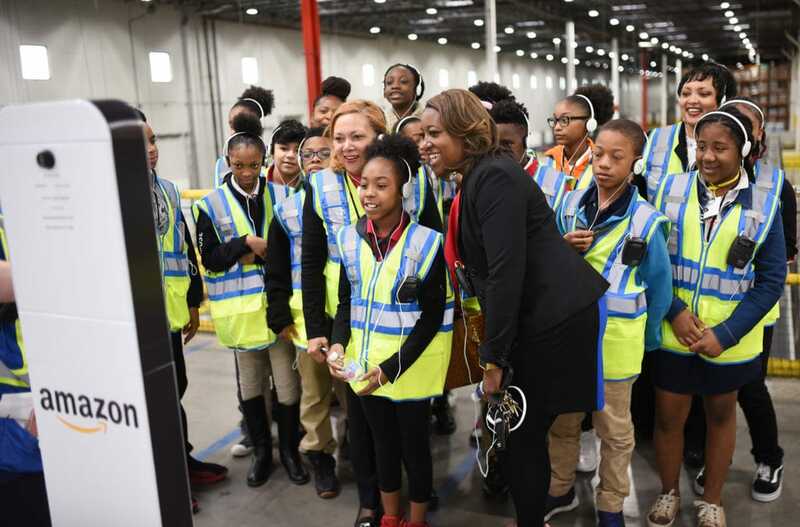 Students from the school were invited to be the first group to tour the Fort Worth Amazon Fulfillment Robotics facility. At the close of their tour, a robot delivered a special package in the form of the check to them wrapped in a bow. Sixth Grade scholar Sydney Surrell said she enjoyed visiting the Amazon facility and couldn’t quit talking about what she learned. George Washington Carver principal Jamilla Thomas took time out of her day to be with her scholars on the Amazon tour. She said she looks forward to more events like this in the future. Lancaster Blended Learning Director Kimberly Clark said the real world experiences like the Amazon tour helps students get a grasp on why school is important. Making this endeavor possible were Fort Worth Amazon Robotics Fulfillment Center General Manager Bill Hicks, Assistant General Manager Mark Hill and Operations Public Relations Specialist Maxine Gray. For Hicks and his team, tours like this are very important as they present questions to students that get them to thinking about the correlations between STEM and real life. Hicks went on to say this is why they want to continue partnerships with districts like Lancaster ISD.